For this Iron Craft challenge I asked everyone to create something inspired by the place they call their hometown. While I didn’t grow up in Minneapolis, I consider it my hometown. It was the city I first moved to on my own after college & the biggest city I had ever lived in. I remember driving back from weekends with my family & the skyline coming into view. I’d feel so thrilled that I actually lived in such a place. Since that time, I’ve lived in bigger cities with grander skylines but, I’ll always have a soft spot for the one here in Minneapolis. I’ve had the idea for this pillow for quite awhile so, choosing this challenge was just a little bit selfish. I’m glad I did though ‘cuz I’m really happy with how it turned out. I’ve even thought of perhaps doing a series of different cities to sell on Etsy. 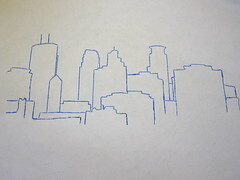 Though really, it’s simple enough that even a beginning stitcher could easily make one of their favorite skyline. 1. Cut two pieces of your fabric the exact size of your pillow insert with no additional seam allowance. This means I cut mine to 12″ x 16″. I find that this gives you a really fully stuffed pillow. 2. 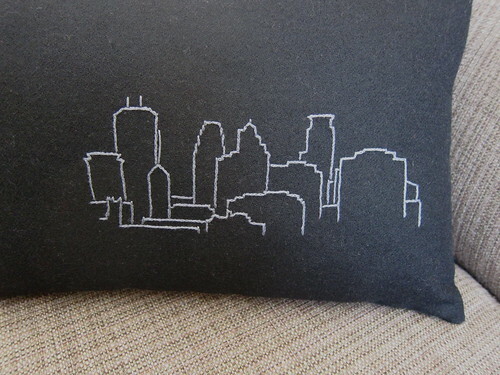 Find a picture of the skyline you want to embroider. Trace the outline of the buildings on to another piece of paper so I can see what it will look like without all the other stuff in the picture. I tried to not have it too detailed as that would be hard to do in stitches. My picture was the exact size I wanted but you may want to enlarge your’s in a copier is needed. 3. 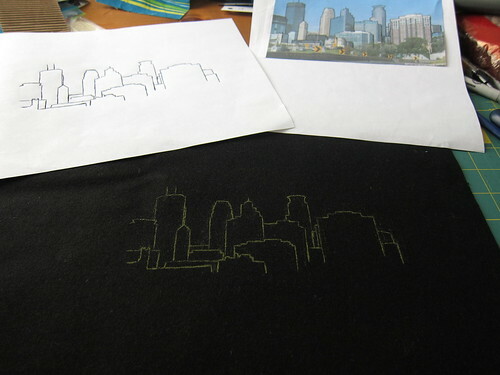 Place your skyline drawing where you would like it on the right side of one of your pieces of cut fabric. Pin it at the top & one side to keep it in place. Slide the tracing paper underneath & draw over your lines to mark the design on your fabric. (A stylus for a PDA works great for this. A pen is fine too just be careful not to break through the paper & mark the fabric with it.) Lift up a corner to make sure all your markings have come through & redo any that need darkening. 4. Place into an embroidery hoop & stitch design. I like to use a hoop bigger than my design if possible so that it doesn’t rub off the design. I used a simple split stitch with a few straight stitches for antennas. I think simplicity looks best here. When I’m done I put a little dot of fabric glue or fray stop on any knots at the back of my embroidery just to make sure they don’t come undone. Press the embroidered fabric to remove all marks from the embroidery hoop. 8 years ago by Kat in Challenges , Embroidery , Embroidery Projects , Iron Craft , Needlecraft , Projects | You can follow any responses to this entry through the RSS feed. You can leave a response, or trackback from your own site. Oh wow–simple, clean looking, but gorgeous! This pillow is so awesome! I might give embroidery a try. oh, i just love it. It is very stylish! I grew up and currently am back living in Minneapolis. Its a fantastic city and I've been wanting to do something with the skyline for a long time. Thank you for the inspiration! Love it! I love this! Do you have an Etsy page? I want one of these pillows! Emily – I do have an Etsy page http://thesnuggery.etsy.com You can contact me on there & we can do a special order if you'd like. Amazing. 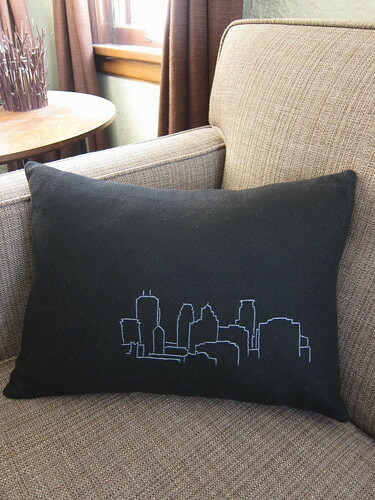 I found your post because I was looking for a Minneapolis skyline silhouette to embroider on a pillow! Your photo and instruction are very inspiring! Now to make one of a new favorite… Cuenca, Ecuador.